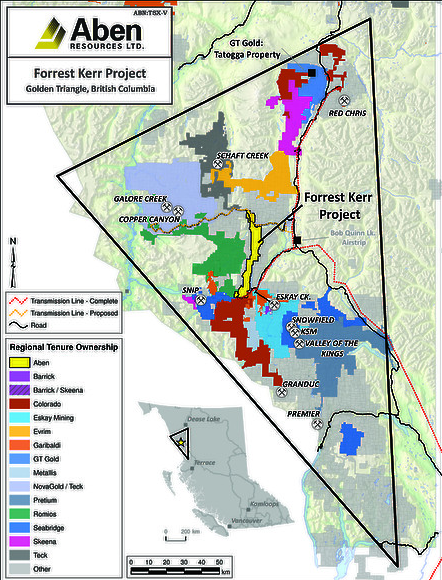 Aben Hot On The Trail Of Big Discovery At Forrest Kerr | Energy and Gold Ltd.
Aben Resources is creating a lot of excitement with its exploration program at its Forrest Kerr Project in the Golden Triangle this summer. 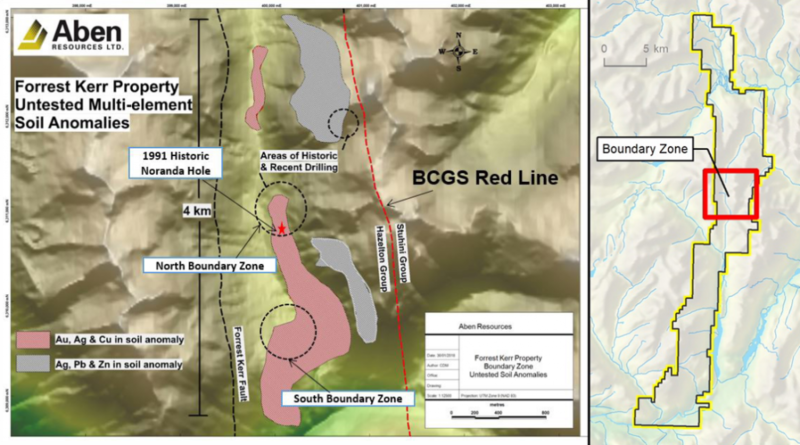 Last week Aben announced that it has discovered mineralization 1.5 kilometers south of the North Boundary Zone in a newly discovered area called the South Boundary Zone. To put this in layman’s terms Aben has hit the same sort of chalcopyrite mineralization as other high-grade holes that have been drilled at Forrest Kerr. Moreover, this area that is now being called the South Boundary Zone was identified due to strong geochemical and geophysical anomalies. Aben is on to something potentially very big here at Forrest Kerr. The company sent the core for the 3 South Boundary holes off to the lab for rush assays which should be returned within two weeks. Depending upon the assay results from these holes Aben may add a second rig at Forrest Kerr for the remaining 4-5 weeks of its summer 2018 exploration program. The key here is that Aben is making discoveries in close proximity and on trend with the most prolific geologic contact in the Golden Triangle, the contact between the Jurassic Hazelton Group and the Triassic Stuhini Group. Even more importantly the Boundary Zone at Forrest Kerr consists of the Hazelton Group of rocks which is known to be a prolific host to several deposits in the Golden Triangle. All signs are pointing to the notion that Aben is on to something special at Forrest Kerr and we may not have to wait long before we receive confirmation of this. This is a bullish sign because the strongest stocks will not allow newcomers to buy in on a pullback, they will be forced to pay ‘full price’. 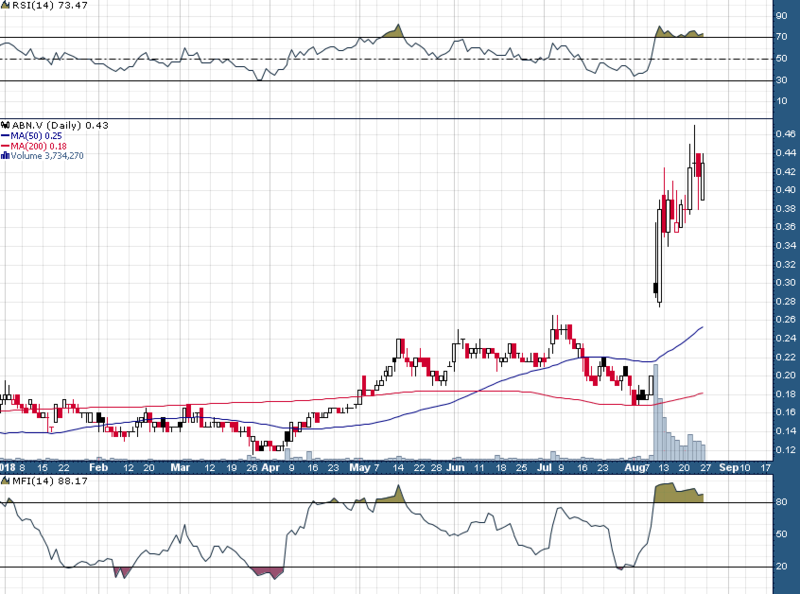 Above resistance near C$.50 I believe ABN shares could easily have an additional 60%+ of short term upside, meanwhile, C$.40 should continue to be support until proven otherwise. Disclosure: Author is long ABN shares at time of publishing and may buy or sell at any time without notice.